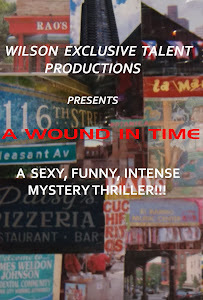 A WOUND IN TIME: LOOKING FOR NEW DATES FOR THE NEW "A WOUND IN TIME"
LOOKING FOR NEW DATES FOR THE NEW "A WOUND IN TIME"
I WILL BE SEEKING NEW DATES FOR THE NEW "A WOUND IN TIME". ALTHOUGH I HAD TO PASS ON LOOKING GLASS THEATRE'S SPACE GRANT I DO LIKE THE SPACE AND MAY RENT IT IF DESIRED DATES ARE AVAILABLE THIS SUMMER. I HAVE LEARNED THAT ALL THINGS HAPPEN FOR A REASON AND ARE USUALLY A BLESSING IN DISGUISE... STAY TUNED.